NASA's planet-hunting Kepler spacecraft, with an assist from the more powerful Hubble Space Telescope, has found what appears to be a huge moon orbiting a gas giant planet 8,000 light years away. 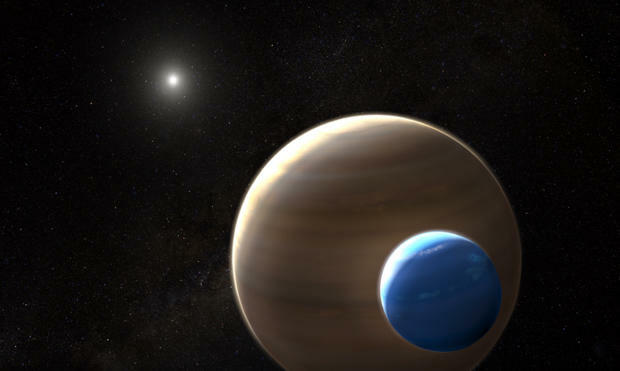 If confirmed, it would be the first discovery of an "exomoon" in another solar system. Kepler, now virtually out of gas after an extraordinary mission, detected more than 2,600 exoplanets by looking for the tell-tale dip in brightness that occurs when a planet transits, or moves in front of its parent star as seen from Earth, blocking some of the star's light. Until now, astronomers have never found solid evidence for a moon. Searching for such evidence, Alex Teachey and David Kipping of Columbia University went back through light curves representing 284 planets discovered earlier by Kepler, all in orbits longer than 30 days. That made it easier to detect secondary brightness dips that might represent an exomoon. And in one instance, they found "deviations and wobbles" in the light curve representing a planet known as Kepler-1625b. The researchers then used the Hubble Space Telescope to closely monitor the star in question, monitoring the light closely as the planet made a 19-hour transit. Three-and-a-half hours later, Hubble detected a much smaller dip in the star's brightness consistent with a large moon trailing the planet. There are other possible explanations, but "a companion moon is the simplest and most natural explanation for the second dip in the light curve and the orbit-timing deviation," Kipping said in a statement. "It was definitely a shocking moment to see that Hubble light curve, my heart started beating a little faster and I just kept looking at that signature. But we knew our job was to keep a level head and essentially assume it was bogus, testing every conceivable way in which the data could be tricking us." Writing in the journal Science Advances, the researchers noted the moon would have to be unusually large to explain the observed light curve, possibly comparable to a body the size of Neptune. The gas giant it presumably orbits has several times the mass of Jupiter. No such giant moons exist in Earth's solar system. If a gas giant exomoon is confirmed by follow-on observations, it may provide new insights into how planets and moons form and evolve across the galaxy.